‘Nature’s Magnificent Eye’, an exhibition of award-winning nature photographer, Suriya Jayalath Perera, will be held in Los Angeles, USA for the first time, on September 15 and 16 at the Ken Locke Hall, University of the West, 1409, Walnut Groove in Rosemead California. ‘Nature’s Magnificent Eye’ beholds the shady trees, green hills, valleys, streams, colourful fauna and flora, breezy air as well as the serenity of jungle life. These amazing creations of nature provide us with a wonderful experience. However, the effects of modern day industrialisation are ever-present threats to the serenity of our natural environment. Nature photographers are in the vanguard of the army of ‘Nature Saviours’. The exhibition is designed to introduce viewers to a range of issues that currently impact the environment. It also depicts the unsurpassed beauty of nature in Sri Lanka, its wildlife, and the 2,500-year-old cultural heritage, through the creative eyes of Suriya, who has demonstrated a sensitivity to the animal and human life that surrounds the pristine environs he has captured through his expert lens. 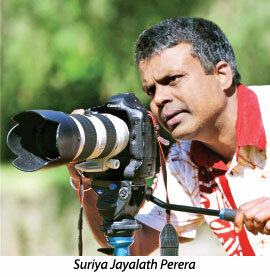 Suriya Jalalath Perera is the president of America Sri Lanka Photographic Art Society (a member of the Photographic Society of America - PSA). 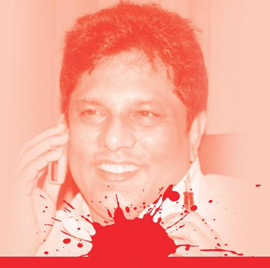 A school teacher, who had been a project officer at the Department of Wildlife Conservation in Sri Lanka. For his Master’s dissertation, he presented a study relating to folklore, folklife, and wildlife of the Yala National Park and its neighbouring locality in Sri Lanka, his native country. The exhibition consists several rare photographs of National Parks of Sri Lanka (Yala, Wilpattu, Udawalawe, Horton Plains) and the last of the remaining rainforests in the world, the Sinharaja Forest, in Sri Lanka. The ancient cities of Sri Lanka with architectural gems that are part of the cultural and religious heritage of the nation, and blend with the tropical fauna and flora being exhibited, also form an integral part of the exhibition. Visitors will also be treated to some magnificent images of national parks in the United States, including, Yellowstone, Grand Canyon, Yosemite, Sequoia, Muirwood, Zion, Arches, Antelope Canyon, as captured by the artistry of master photographer, Suriya Jayalath. Emeritus Prof J.B. Disanayake of the University of Colombo, the chief guest will share his extensive knowledge of language, historical arts and Architecture, Buddhism and cultural heritage with the visitors. Dr. Hasantha Hettiarachchi, Program Director and Manager of Independent Television Network (ITN) will address the visitors at the opening ceremony. The program will be telecast on ITN in Sri Lanka. Chief guest Prof. Disanayake, guest of honour, and The Consul General of Sri Lanka for the Western States of U.S.A. Mrs. Swarna Gunaratne will open the exhibition on September 15 at 4 p.m. The hours will be from 4 p.m. to 8 p.m. on Saturday, (15) and 10 a.m. to 2. p.m. on Sunday (16).